Light. It is this natural phenomenon that all the time captivates human thoughts and perception. And it was light that eventually opened up the broadest realm for human apprehension of natural law. From Euclid, Ibn al-Haytam, Ibn Sina, and then Isaac Newton to Albert Einstein, all have been fascinated by light. Filled with flaming curiosities and buzzing ideas in mind, they attempted to understand and reveal the secret of light. It was this understanding of light that finally heralded the ultimate achievement of Physics, and subsequently opened up a new way for human being to understand the nature of various physical phenomena. Nevertheless, no one could be so insightful in demonstrating the power of light as the determining aspect of representation—the depiction of many dramatic situations in human lives—if compared to what has been achieved by Michelangelo Merisi da Caravaggio (1571-1610). He attained his capacity not through arduous exploration of the secret of natural law but as the results of his insight refined with sensitivity and strong desire to show the light—an electromagnetic radiation that animates the world in human eyes—as élan vital for various forms and stories presented in his paintings. Caravaggio—that’s how he is well-known—is a scoundrel but talented painter. He grew up in Italy, during an era when the country ran into political turbulence. At the time, the Roman Empire desired to re-establish its supremacy, while the Catholic Church was trying to restore its authority already undermined by the Reformists. In the midst of uncertainty, Caravaggio had to cope with difficulties to become a great painter, when the superiority of Renaissance arts leaved no more than futile remnants of the past already paralyzed by Mannerism. Inescapably, Caravaggio had to grow up in the midst of such insecure and vexatious circumstances. Though ironic it may seem, he aspired to dedicate his live to be a great painter with distinctive artistic attainment, admitted by his colleagues and admirers as well as his enemies and denunciators. He did everything to realize his aspiration with such a genuine approach, so that his works were often considered carelessly as rough and rudimentary by people of the time. Peter Robb, the author of one of Caravaggio’s biographies (M, 1998), says this artist is a real pioneer—comparable to Galileo, Cervantes, Shakespeare—who, by his own way, has opened up a new field to cultivate the spirit of modernity in European civilization. Caravaggio achieved what he dreamed of quite soon, as if he wanted to accomplish his short life quickly. Towards 40 year-old, he died. What remains and fascinates us until today is the fact that all dramatic stories he lived through his life, which inevitably suffered various kinds of violence, look consistent with the dramatic lives he recorded in his paintings. Today, Caravaggio is widely known as one of the world’s modern art masters as he truly believed that painting could only gain its strength straight from real life, and that an excellent artist should always hold on to awareness that good artworks should represent one’s personal outlook on art and life. In contrast to prevailing practices of the day, when artists were apt to repeat the method and styles of art-making already known and widely accepted by public and clerics, Caravaggio created his artworks by painting models, people he met in streets or bars, or those he knew personally. Without sketches, he painted the models directly. He directed the pose, movement and expression of the models in certain setting so as to produce visual composition and narrative that he wanted to present on his canvas. People’s temperaments, poses and acts portrayed in his paintings are so close to real daily life. That’s why his paintings were often viewed as banal and profane representations, not those regarded as having symbolic and sacred qualities. In an era when people needed to restore the authority of Catholic doctrines, Caravaggio’s paintings often provoked denunciation. His paintings have several times been refused by the clerics who had ordered them, since the depiction of the holy religious characters in Caravaggio’s paintings—according to the clerics—are improper, “too real, like ordinary human being”. Apart from situation told above, light is the principal element he counted as important aspect in his paintings. It was said that he liked to arrange light—its direction, the appearance of its reflection and degree of luminosity, including the use of cloth and mirror as reflector—so as to illuminate parts of the face and figure of his models, in such a way that the arrangement of light can produce dynamic visual composition and narrative. Technically and artistically, Caravaggio has brought chiaroscuro technique far beyond the level demonstrated by Raphael and Leonardo da Vinci. Now, Caravaggio’s method is widely known as tenebrism, a technique of arranging light in painting that gives emphasis to contrast between light and dark. The more important is that Caravaggio, by means of his light arrangement, has been able to bring the dramatic stories of human lives under the focal point of light, so as to draw powerfully our attention, and subsequently penetrate deep into our emotion and consciousness. It is also light that has brought Carvaggio to meet with artist whose artworks are showed in this exhibition, Filippo Sciascia. Filippo Sciascia is an Italian artist who at the moment lives and works in Ubud, Bali, Indonesia. He was born in Parma. His first education in fine arts began in Florence, and then in Trieste, Italy. He continued his study in New Jersey, USA. He arrived in Bali in 1998, where he built his studio and has lived there ever since. In Indonesia, since early 2000, Filippo has started to introduce his artworks in the forms of videos, installations and paintings through a number of exhibitions. Indonesian art public soon began to know Filippo’s artworks—especially his paintings—due to the uniqueness of their visual characteristic. His paintings are often made in monochromatic colors—even consist of only black, gray and white. Sometimes the paintings show images that look more like photograph, and sometimes they represent a landscape or streets of a town or ordinary objects usually found in daily life. As to his paintings, Filippo is especially renowned for this: his paintings are usually made on a canvas that has been painted before with white color—a mix of special pigments and substance—so as to produce a thick but fractured layer of paint on his canvas. Varying images, in monochromatic colors, would then emerge on the fractured space, look like fragments of painting left on the surface of a nearly destroyed wall. Or, to be precise, like a thick layer of paint on a piece of an old, dilapidated painting—a mosaic of chaotic fragments. Additionally, his paintings have always been connected to issues of light. Painting is, in fact, simply a medium used by Filippo to explore his complex ideas about problem of image identification and creation, in an era flooded with images and pictures—visual products and visual culture—especially those related to image production and perception using camera technology. That’s why he has always been interested in video art and photography. Painting, in this matter, is manifestation of his further attempt to identify issue of “how the eyes see” the world. In many of his solo show projects, the complex relations between images recorded by camera, edited to be short movie, showed on TV screen, and painting, are presented simultaneously. This, therefore, implies the presence of implosion in Baudrillardian sense: agglomeration of message-images that appear all together, overlap one another, until the boundaries between the real and the virtual eventually vanish; the dissolution of differences between the real and its representation. However, in his various artworks that arise with diverse image-games, one can find an element continually present secretly, as it is never seen as real. The element is light. At the moment, Filippo already realized the existence of the element, since without light all those image-games that he presented through various media will appear as nothing. It is light that has made all those forms and images present, perceivable, and therefore “exist”. In his series of paintings entitled “Lux”—made before he started this “Caravaggio project”—he gives a quite important and special place to the existence of light. An example for this kind of works is “Lux 1”. Though this painting is not part of the “Lux” series, it proceeds through the same procedure. “Lux 1” demonstrates how Filippo tries to approach this issue. From the outset, image presented in this painting is already a part of implosion. At first, the picture of an act in this painting is captured from a video record taken by Filippo when exploring this issue of light (this record is also presented in this exhibition). At the same time, the act is an appropriation as well as reinterpretation of Caravaggio’s painting entitled “The Deposition of Christ” (1602-1604). And, finally, this act is also transformed into painting. In painting that refers to video-recorded act, Filippo split up the painting area by making two black areas on the left and right sides of canvas so as to produce picture different from the one recorded with video camera. We are now placed in position like a peeper, or a witness, hide in the dark and see the act through the doorframe from the next room. There are figures of people in the act. We can see clearly the shapes and contours of some, while the others seem obscure and disappearing. But all exist as they are exposed to light. Those illuminated too much seem unclear or completely vanish, merge with the white surface of canvas. Conversely, those unlighted look indistinct, dark and black. The visible and invisible, light and dark, white and black, all are present, exist and determined by the radiance of light. Certainly, Filippo has long since known Caravaggio’s works. During his student period in Italy, he visited a large number of art museums, saw the works of the art masters and tried to imitate the works. Now, he doesn’t simply imitate Caravaggio’s works but—along with and through Caravaggio—explores diverse art issues, which eventually are presented all together in his series of artworks. In spite of that, Filippo at the moment still needs to imitate three of Caravaggio’s works, or, to be precise, tries to revive the paintings in the form of small-sized ‘imitations’. The paintings are “The Deposition of Christ”, “Judith and Holofernes”, and “St. Jerome Writing”. From the three small paintings—which in fact are his study of, and homage to Caravaggio—have emerged a number of works that demonstrate how Filippo employs his unique painterly strategies. At first, what he do is to analyze how far he can still add element of light to certain parts of Caravaggio’s paintings, in which the sources of light are already isolated. Filippo intentionally tries to emphasize the existence of the sources of light. He wants to bring these sources of light back to Caravaggio’s paintings. As a result, the light in Filippo’s works seem like radiating from the inside of canvas, push that flat area so as to open out and break up. Unusually, in these paintings that focus more on light element, monochromatic colors—black and white—often used by Filippo are now exposed so strikingly. Like in a black and white photograph, Filippo intentionally put Caravaggio’s paintings in an extreme game of light: certain parts of them seem like over-exposed while the others are under-exposed or completely unexposed. The topmost of all is “The Deposition of Christ” that he presents on large canvas, where Filippo shows the most extreme contrast. This painting is completely in black and white, nearly without mid-tones. Besides, Filippo also shows Judith’s face in close-up. The face is exposed to extreme light so that the details seem vanished, merge with white color. Hence, in his current artworks Filippo uses the white area of his canvas as the source of light. He adds only gray and black colors to the unilluminated parts, while the most illuminated parts should be completely clear. In addition, like Caravaggio, now Filippo tries to discipline himself by painting directly on canvas, without sketches. 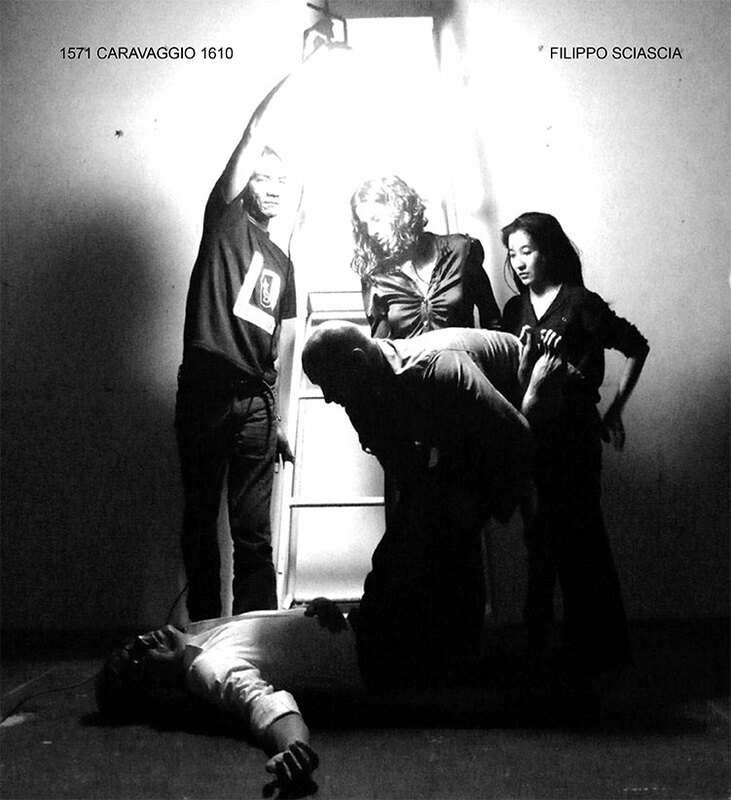 I already mentioned above the issues of plurality and complexity in his artistic approach that so far have been the strong point of Filippo’s artworks—such as those demonstrated by a number of works related to Caravaggio’s “The Deposition of Christ”. This also applies to Caravaggio’s “St. Jerome Writing”. Filippo shows ‘imitation’ of the painting on small canvas, illuminates it on larger canvas, and eventually represents it as overlapping appropriations on other canvas. The latter obviously refers to another kind of reference: a scene in Derek Jarman’s film, Caravaggio (1986). Filippo passed through all these complex procedures enthusiastically. In the end, he succeeded in shedding ‘a new kind of’ light on Caravaggio’s artworks. Moreover, these in fact also indicate the restlessness of the artist who wants to continually examine various artistic procedures he has passed through so far, in order to weigh up his own creativity. At this moment, he involves Caravaggio in his process of investigation. For Caravaggio’s fanatic fans and followers—if they actually exist—maybe his experiment will be considered as nonsense, even treacherous. As to Caravaggio himself—the brilliant artist who has persistently defended his belief in artistic ‘sincerity’ and ‘rightness’, in spite of adversities throughout his live—he would likely be happy to know what Filippo has attempted to discover new light in his artworks. Perhaps, he will recite Genesis: Fiat Lux! About Filippo Sciascia’s “Sophia 19:38” (2006) and “Trinacria” (2007), see Rifky Effendy, On Filippo Sciascia’s Works, (http://www.filipposciascia.it/press_sophia_rifky_eng.htm); and Robert C Morgan, Filippo Sciascia’s Uncertain Allegory. (http://www.filipposciascia.it/press_sophia_robert_eng.htm). Howard Hibbard, Caravaggio, Westview Press, 1983. *Sigit Jatmiko for English translation.